← With hundreds of millions of ratepayers and taxpayers money going into public transport, the question is, are we getting value for money? Auckland Transport’s announcement in January that it was seriously investigating a Light Rail solution for Auckland as a part of the draft Regional Land Transport Plan, came as a surprise to a lot of people but it’s the best news on the transport front for Auckland since the go-ahead for rail electrification. Auckland Transport (AT) has taken this remarkable step – leap more like it – because its modelling and number crunching in the City Centre Future Access Study kept pointing to the inescapable conclusion that by 2021, the recommended maximum of 130 buses per hour on key city corridors like Symonds Street will be seriously exceeded – even with the City Rail Link. This means chronic grid-lock. AT is therefore scoping a modern Light Rail Transit (LRT) system comprising four lines, Dominion, Sandringham, Mt Eden and Manukau Roads, converging on Queen Street and Symonds Street, with the first stage a 7 km Wynyard Quarter, Queens Street, Dominion Road line. Much more modest than Auckland’s historic 72km electric tramway but, in our time, without doubt a bold and visionary concept. Auckland’s position is not unique. The world-wide revolution in urban mass transit which occurred 60 years ago, that saw light rail, (electric trams) replaced, mainly by diesel buses is now turning full circle – but this time buses in inner cities are giving way to modern high-tech light rail vehicles or trams. This is happening in small to large cities across Europe, North America and Asia. There are now 400 cities with LRT now operating. In Australia, in addition to Melbourne, the smart exception that held fast to its trams, Sydney has a major LRT construction underway, Gold Coast has completed the first 13km stage of its light rail system, Adelaide its expanding its light rail system and Canberra is a tender stage. Across the world 60 LRT networks are under construction and another 200 are planned. Apart from its basic transport efficiencies Light Rail has been a proven catalyst for urban development. Modern trams on the Gold Coast for instance have dramatically transformed the place, rescuing the Gold Coast from what once seemed an inevitable fate of tackiness, instead giving the place a European-style gravitas. Light Rail Transit is more efficient and more economical, emission-free and much quieter than buses. As LRT carries more people, 300 – 450 passengers on a modern tram versus 60 people on a bus, it is passenger and therefore revenue rich. This heavy patronage (low-margin, high-turnover model) was of course a feature of the historic tram systems. Because of this factor all the NZ tram systems in the 20th century were unsubsidised and indeed ran at a modest profit. In regard to the Auckland tramway, when it was terminated in 1956, it was carrying over 80 million passengers a year when Auckland’s population was only around 300,000 people. After the trams were withdrawn public transport patronage levels in Auckland collapsed. Despite the population now being around 1.5 million, and the expenditure of billions of dollars in subsidies over recent years, public transport in Auckland has yet to fully recover from that disastrous decision. It is now just 79 million trips per annum for all modes. Yet in its first year of service in 1904, the Auckland Electric Tramways Co Ltd carried over 13 million trips per year (Auckland’s current train patronage level). This at a time when Auckland’s population was only 70,000 people. The company made a net profit of £20,823.00 in its first year and this increased modestly with patronage growth over the years. The strength of LRT is its flexibility in the way it can operate. Running through inner cities, sharing the road with cars, buses and pedestrians, and then running through the suburbs, often on dedicated tracks, more like a train. The private sector lobbying (from the oil motor industry interests) which was a feature in the removal of the trams in the mid-1950s, right across the world, is again a factor in the world-wide light rail revival. This time from international operating and infrastructure companies, interested in public-private partnerships. These see Light Rail as mutually profitable for both cities (in terms of city building and transport solutions) and their shareholders. This innate ‘bankability’ also makes start-ups financially feasible. A note of caution. If Auckland were to adopt Light Rail we would need to ensure that the financial efficiencies to be gained from the expected high patronage and lower cost operations are not cancelled out by the twin menace of local government gold-plating on the one hand, and rorting by the construction sector on the other – a particular danger in New Zealand’s monopolistic construction environment. 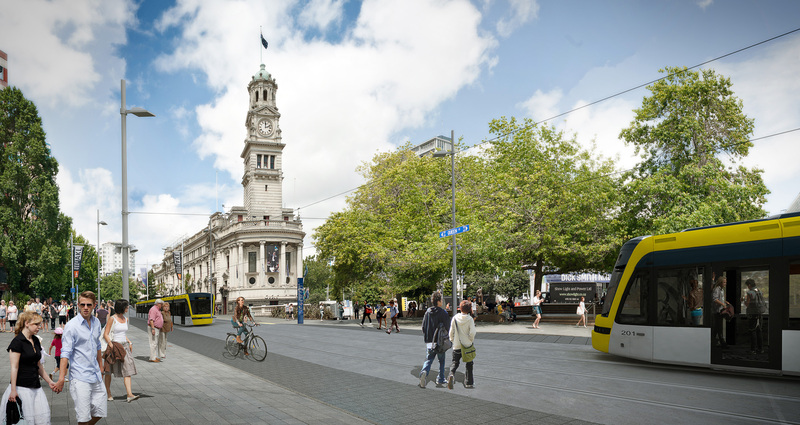 Auckland Transport first signalled its intentions for Light Rail in the draft Regional Land Transport Plan and despite this being a major surprise, the idea was well received by Aucklanders. A total of 1390 public submissions were received on Light Rail and of those, the vast majority 1250 (89%) were in support, 73 were opposed and 74 not indicating an opinion either way. Declaration: Mike Lee is a director of Auckland Transport and a qualified (heritage) tram driver.